I love my 128GB Surface Pro. I can’t wait for a driver for Wacom pressure sensitive support and a fix for legacy desktop scaling, but other than that, Surface Pro is a wonderful electronic companion that does just about everything. As with all software, there are bugs. And I think I’ve found a corker. 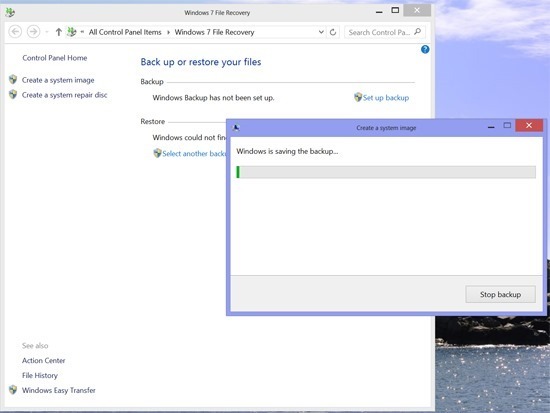 On my Windows 7 machines, I’ve always installed all my apps and configured them and then performed a system image backup (using Windows 7 built in create system image backup tool) both to an external hard drive and over the network. As I added major apps, applied Service Packs and major app updates, I’ve renamed those backups and performed new image based backups. WHS performs the same kind of image based backups, too. 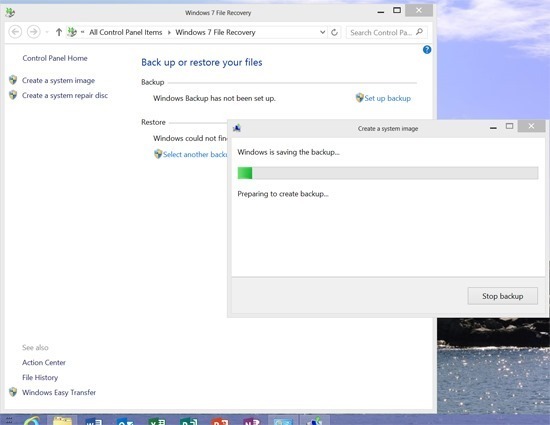 Windows 8 emphasizes some dumbed down recovery methods, including system refresh. The refresh will keep some, but not all of your files. You will lose your installed desktop programs and will have to re-install and configure them. Most Windows Store Apps will be retained, but if you bought a Surface Pro, you bought a machine to run real desktop apps. The control panel applet appears (you can also find the applet in the classic control panel when the show small icons view is active). I next selected Create a system image. My external hard drive connected by USB was detected. 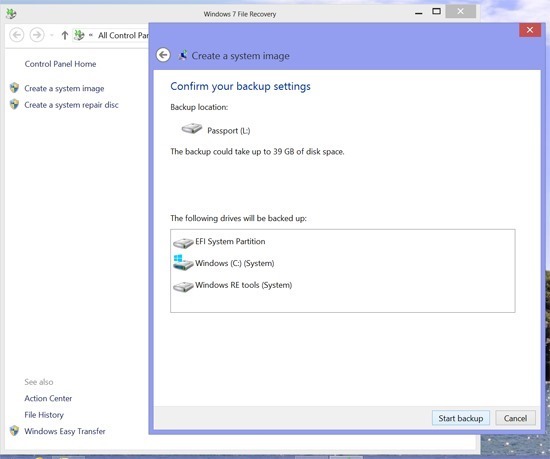 A confirmation box appears with everything preselected (you cannot deselect any because this is a full image of all partitions on the drive/SSD) and the backup location I had selected. I tapped Start backup and the following screen displayed (so far so good). What happened (or did not happen) next is the source of my aggravation and complaint. I reformatted the WD drive, tried 3 other drives, sacrificed a rubber chicken, with NO success. I checked the Microsoft forums. Uh Oh, others had experienced the issue and MS Support was clueless, offering solutions like chkdsk and/or sfc /scannow. The real issue is that the hidden partitions that contain the recovery partitions and the secure boot partitions don’t contain enough free space for VSC (Volume Shadow Copies) themselves. http://answers.microsoft.com/en-us/surface/forum/surfpro-surfgetstart/windows-7-file-recovery/a73b83ff-2511-44d9-b8a7-85bfd1135e87 is what Surface Pro owners are experiencing. 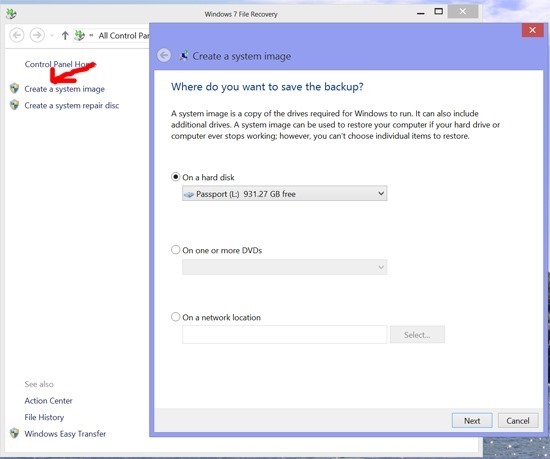 http://answers.microsoft.com/en-us/windows/forum/windows_8-system/there-is-not-enough-disk-space-to-create-the/48532922-25bb-46fb-af8b-475ff05f55ce shows similar problems on other systems dating back before the release of Surface Pro. Here is the (really not too informative) breakdown of space allocation on my Surface Pro. The three small factory partitions must be the issue. 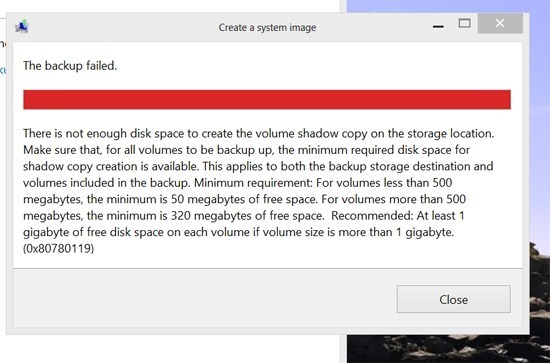 The @Surface folks on Twitter did not understand my tweets on this and kept trying to tell me about freeing up space by creating a USB flash drive bootable recovery device and deleting the 7.8 GB recovery drive. This is not the issue at all. I finally pointed them at a YouTube video demonstrating the process above. They finally tweeted “ http://www.twitter.com/surface/status/302581927423115264 “ but I am not holding my breath. In the meantime, I am investigating third party image creation tools. But I maintain that if Microsoft offers the tool on Surface Pro, it SHOULD work, or they should document it in a KB prominently. I was more than discouraged when my WDTV Live Hub, which was the poster child for Windows 7 Play To, did not show as a certified device for Windows Store Apps in Windows 8/Surface. Sure, the classic desktop interface worked, but I felt as though a promise had been broken. I had the latest available firmware from October and others posting on the WD user forums were also miffed. Device certification is not handled in any way via Windows Update. We have a service, called NCD-AS (auto setup for short) that will automatically find media renderers and pair them (even if they aren’t certified). As part of pairing, PNP updates drivers and metadata packages for a device if available. Every 8 days, this service will check for updated drivers and metadata packages for all media renderers that have been paired. One of the things I’m being asked more and more frequently is how to get rid of embarassing or unwanted pictures that scroll through the Windows 8 Photo App Live Tile even after being deleted from the user’s Photo Library. 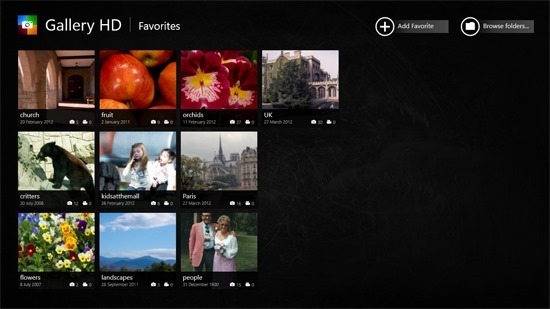 Microsoft wasn’t smart enough to clear the Live Tile image cache when a photo is removed and many folks are asking how to do this. First, make sure you delete the offending image(s) from the classic desktop/library or from SkyDrive, Facebook, or Flickr (or move them to a non public location or different folder on your computer NOT part of your Photo Library. Fourth, now that you can view the cached images, select the ones you want to remove and permanently delete them. Be sure to delete both the LargeTile*.jpg and SmallTile*.jpg (where * is a number) for the picture(s) in question. 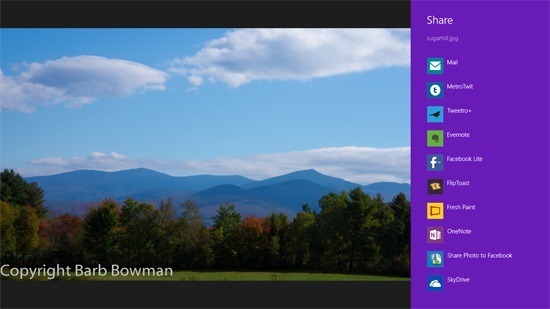 Fifth and final step, from the Windows 8 Start screen, swipe up on the Photo App tile or right click it and select Turn Live Tile Off. Then swipe up/right click again and turn it back on. It will repopulate without the offending image. If the above is too much work, or if you have embarrassing emails scrolling in the mail app or tweets/Facebook comments, etc. 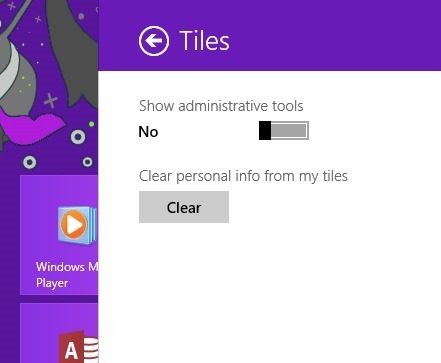 scrolling through the People App, you can use the sledgehammer approach to clear all Live Tile data. 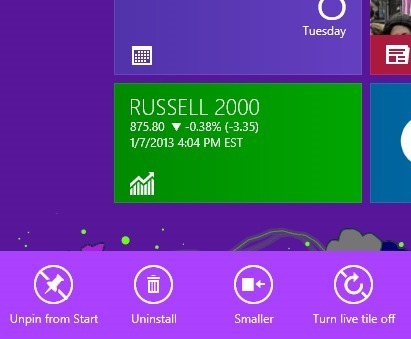 From the Windows 8 Start screen, select Settings, Tiles, and Clear personal information. This will clear all info from all tiles. Each tile will rebuild with new info from the point at which you cleared the info and the previous “bad” info will not be included. I have been more than just a little disappointed and frustrated with the Microsoft supplied Windows Store Photo App for Windows 8 because I have tons of digital images stored on networked drives that are nearly impossible to view in the Microsoft default app. 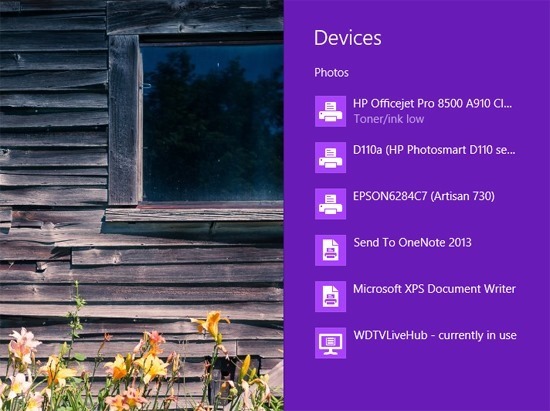 The MS Photos app is great if your digital photos are stored on the local computer in the default location and/or somewhere on one of the supported cloud providers, SkyDrive, Facebook, Flickr, etc. The problem for people like me who are hobbyist photographers is the non feasibility of putting everything in the cloud (even if I desired to do this, multi terabytes of storage would cost me dearly). 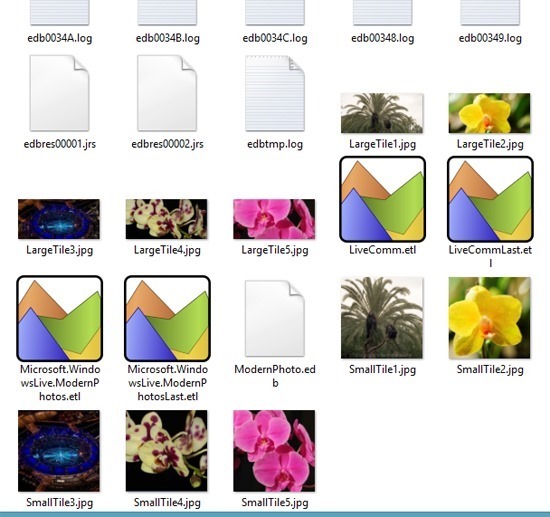 Coupled with the weak functionality of the MS Photos App for someone who wants to view EXIF information, etc. on individual images, caching issues on the Photos App live tile (delete something in Pictures and unless you delete personal info from ALL LIVE TILES from the Start Screen using Charms, Settings, Tiles, clear personal information, the deleted content refuses to disappear) have frustrated me to a fare thee well. So I’ve been looking around for a Windows Store App that fit my needs. I found an app called Gallery HD from Frozen Volcano that solves a lot of my problems. In a lot of ways, it’s what the MS App should have been. I’ve added 10 folders so far. 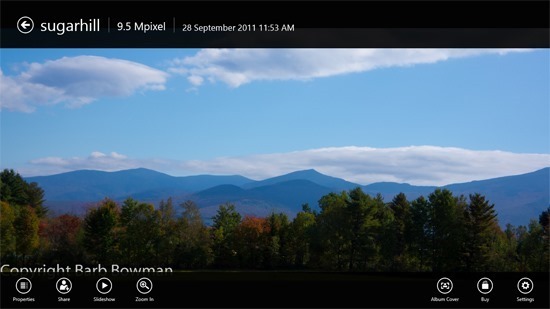 You drill down in a Windows Media Center like manner and more functionality is revealed. Swipe up or right click to reveal a menu of options as shown above. Select Properties, and if EXIF info is available, it is displayed. You can share with other apps easily as well. Initial setup is pretty easy, your default Pictures library will be auto-populated, but the file picker easily lets you add other local locations, including removable media. 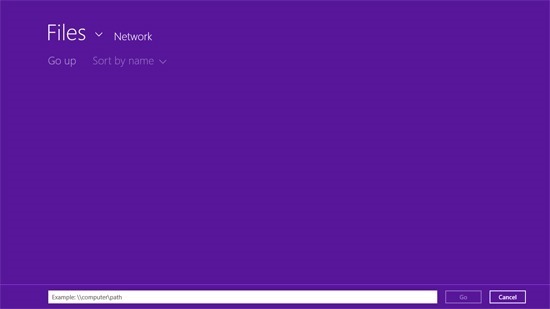 Adding networked resources is a little more difficult if you do not use a Homegroup, as you need to know the UNC path (the format is \\computername\foldername), which is the same issue as found on the default Microsoft Photos App, but at least an interface is provided for you to enter this information. 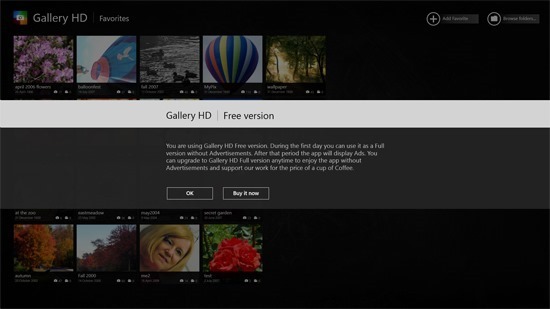 Gallery HD has a Live Tile which cycles through mini collages of your digital images (this is one area where I prefer the method used by the Microsoft app). You will only get one day to try this app, but after two hours, I spent the $2.99 to get the ad free version. I figure the $2.99 versus the extreme frustration with the MS App speaks for itself. I wish Microsoft would have provided a better free solution for such a high profile application, but I certainly appreciate what the folks at Frozen Volcano have done to put me out of my misery. I note that the Gallery HD app is also supposed to handle Video, but I have not experimented with that aspect of the app yet. 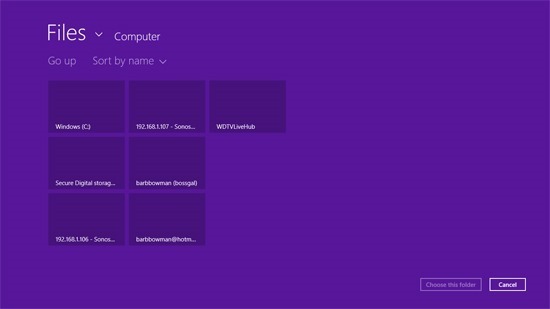 A growing number of Windows 8 users have reported an error with Windows 8 Pro x64 with the Windows Media Center Feature Pack installed where DRM content does not work because of an issued with the HDCP protected video path, possibly caused by having the Hyper-V “virtual display driver” installed on the computer. As shown above, the error is “Display driver error – The video playback device does not support playback of protected content”. There is a possible workaround for anyone who is not using WMC8 IN a Virtual Machine or who is running other VM’s on the box in addition to the main OS with WMC, e.g., for anyone not actively using Hyper-V in any way.